& 2016 Victorian Family Photographer of the Year – Kath V.
Kathleen Vergara (Kath V.) is the vision behind Kath V. Photography and regarded as one of Melbourne’s most talented and progressive newborn and baby photographers. Kath’s natural ability is complemented by an imaginative styling and design sense, which explores a fanciful and enchanting genre. Over the past five years, Kath has continued to refine her distinct technique and draws inspiration from every baby starlet that graces the studio. Kath’s relentless strive for perfection is consistently reflected in her ability to capture the perfect moment in a classical yet contemporary portraiture. Kath is a highly sought after International Speaker and Teacher having taught and presented in 5 Continents and 15 countries. Her proudest moment was presenting in front of 500 Brazilian photographers in August 2017 in Sao Paulo Brazil. Behind the scenes, Kath runs a profitable and growing business, which she rates equally important as the quality of her work. Her astute business knowledge, marketing and sales techniques have seen Kath V. Photography as one of the World's most successful newborn and baby photographers. 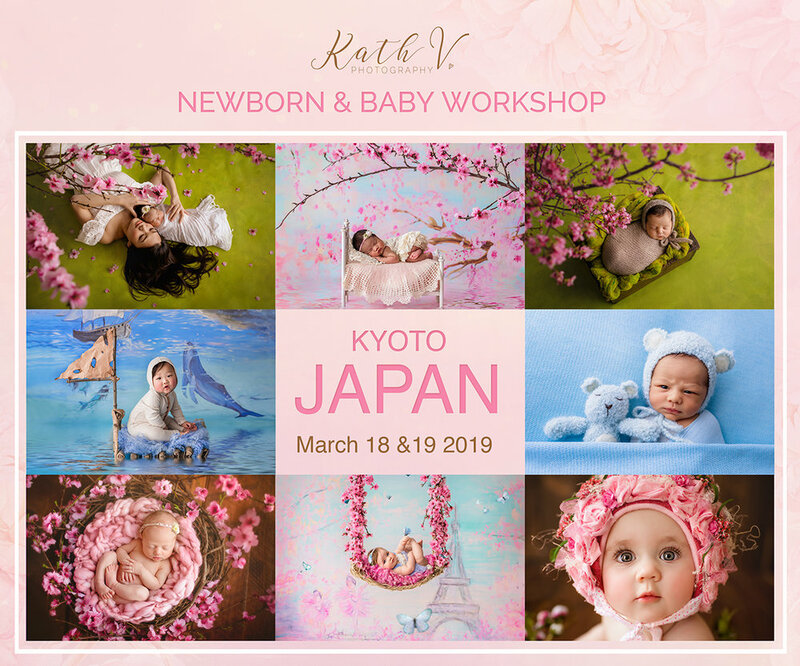 Two days through the lens of Kath V. will explore the essence of creating breathtaking and eternal newborn and baby portraits in an elegant and whimsical showcase as well as building a successful and thriving photography business. This 2 full-day workshop is designed to be interactive, enticing your individual style to shine. Kath’s passion for newborn and baby photography is infectious, her work is brilliant and this opportunity presents a priceless investment in your career. Whether you are an experienced professional or entering the industry, this workshop will provide a wealth of knowledge, proven business strategies and a mentor in Kath who loves seeing her protégées succeed. Workshop Tuition Fee for 2 days workshop is ¥160,000. ¥ 50,000 - NON REFUNDABLE Retainer due at the time of booking to secure your spot. Open to intermediate or advanced skill level in photography looking to add flair, colour and whimsy to their newborn and baby photography. Must know how to use camera in manual mode and have basic knowledge of Photoshop and or Lightroom. The workshop will run over 2 days from 9:00am to 5:00pm. Lunch, snacks and refreshments provided. Kita-Ku, Kyoto City - March 18 & 19, 2019 SOLD OUT ! The workshop will be taught in English. A Japanese translator will be available. Participants will supply their own camera & lens (recommended 35mm or 50mm) and have basic knowledge of Lightroom and Photoshop. Kath will demonstrate how to create dreamy set ups as well as how to safely pose newborns in a relaxed , comfortable and in a flattering position. The importance of newborn and baby safety. How to properly light baby using natural window light. Composition and Angles to maximise gallery without changing too many set ups. Smart Prop selection and investment. * Parents or sibling portraits maybe covered but not guaranteed. This will be dependent on the models chosen on the day. There will be 2 newborn models on the day. *** Please note - Beanbag poses will NOT be covered. The remainder of the afternoon will take attention off the spotlight and into the nitty gritty of running a successful photography business. It is one thing to take great images and another to create a thriving business; an area that Kath sees many talented photographers fall short. Kath will outline the key marketing, sales and business strategies that she has used to grow the business year after year. Most crucial to Kath success is her ability to sell a session and secure repeat and referral business. Pricing and products will also be covered intensively. Kath V. will demonstrate how to interact, connect & pose babies in a fun and engaging way. Along with basic baby poses (that sells and parents love), Kath will also demonstrate the fine art of capturing her signature bonnet portrait in a subtle yet captivating style that embellishes baby’s features as the hero of the photo. Baby on a Bucket, Bowl, Bath Tub or Box. One Outfit 20 plus Images (attendees will observe and photograph at the end). Fantasy Backdrop and Set Up. There will be 3 sitter models on the day. Now it’s time to switch focus and watch your creations come to life. Kath will demonstrate her unique editing techniques that perfect images into sophisticated finished products using Lightroom and Photoshop. Kath will show you how to develop your own Lightroom preset to speed up your editing workflow. Kath will edit 1 newborn image and 1 sitter image from Raw file to fine art portraiture. “ Though there are many photographers whose work I admire, there are only a handful that rank among my absolute favorites! ... Which is why I was so excited when Kath’s Mastering Sitters Workshop came to Southern California! Kath has a kind and authentic presence about her that is a pleasure to experience. She genuinely want to teach and help each of her students raise their skill level and be their best. She asks for feedback and ways that she can be more helpful, because it is important to her that her students garner as much as possible from their time with her. Kath’s workshop was a great experience. It was a real treat to watch her work, creating her beautiful setups as she shared her knowledge, her secrets and her wisdom. Though her work has always inspired me, I was especially impressed and excited by the simple editing process she uses to create her flawless images! I know that workshops are a big investment, but I’m a big believer in continuing education and professional growth to stand out in the crowd. I highly recommend Kath’s Sitter Workshop. It was worth the investment and I’m truly grateful to have had this opportunity. Thanks Kath for helping me so generously, in my quest to continually raise my own bar. “Dear Kath, Thank you for bringing your magic to Dubai! The workshop was amazing! Loved your teaching style and gentle guidance during shooting and your down to earth nature. I will try to remember all the tips and advice you shared on styling the sets, correct shooting angles and position, editing, marketing and business growth. The workshop was long and intense but every minute of it was worth in gold for me. At the end of the day I felt more knowledgeable, more confident and very satisfied as a photographer! And now looking back at the pictures, I see so many treasures among them - can’t stop admiring them! And all that Thanks you! So again - Big Thank You for sharing your expertise! “Hi dear Kath! I just really wanted to thank you. After attending your workshop and buying the videos I just entered this wonderful word full of Colors, I always loved them but I was afraid of using them ! I started creating my own bonnets, painting my props and found my own photography style ! It wasn’t only what I learnt from you but the attitude you had that day full of positivity ! I want to thank you for it because I know it will be hard to pursuit my job but I know I wouldn’t change it with anything else , I also know I have to grow so so much but I love my works , and loving my own work was one of the main goal I wanted to achieve! So thank you!